Mobile device traffic is increasing rapidly, so does your blog or website pass the mobile friendly test? In one year, mobile device traffic to my websites and blogs has increased from a little over 20% to well above 50%. This does not include tablet traffic, which remains steady at a little under 10%. These statistics from Mobile Marketing Statistics show details of the trend, and how desktop traffic is now running second. So what does this increase in mobile device traffic have to do with authors and writers? A lot in fact. As has been the habit for so long now, many authors have got used to the idea of blogging to promote their books. This has meant writing informative and interesting blog articles and including book promotion links in the sidebar of their blogs. This is all well and good for the desktop version, but for mobile users, it’s a loser. A web design disaster in fact. Why? Because all the blog sidebars that are visible for desktop users, disappear for mobile users. Not entirely disappear, but they do get shoved to the bottom of what a mobile user sees when they view a website. So what is included in sidebars is mostly missed or ignored unless users scroll all the way down to the bottom of the page. This is also a big problem for authors with self-hosted blogs that carry Google Adsense advertising in their sidebars. Again, this advertising will be totally lost to mobile device users, because it will be moved to the bottom of the page after all the comments, share buttons and related posts. What this change in technology and user behaviour means is that blog and website owners will need to adapt and change their sites to make sure that what is important is included within the body of each post or article, and not in a sidebar, which your mobile audience is unlikely to see. Responsive web design is now the standard for most blogging platforms to enhance mobile usability. However, while responsive sites do make a website mobile friendly, it has a lot of trade-offs. For my own site, this is the view desktop readers will see. Notice my sidebar contains popular and recent posts and comments. But for my visitors using a mobile device, this is what they see when they view my mobile site. No sidebar, so no recent articles and comments. This, of course, creates a very big problem and requires a total rethink about how you can best utilise a mobile friendly website. If more than 50% of visitors are not seeing what you would like them to see, it means redesigning your website layout. The easiest way around this problem is to move everything important that you want a reader to see into the body of a blog post or article. 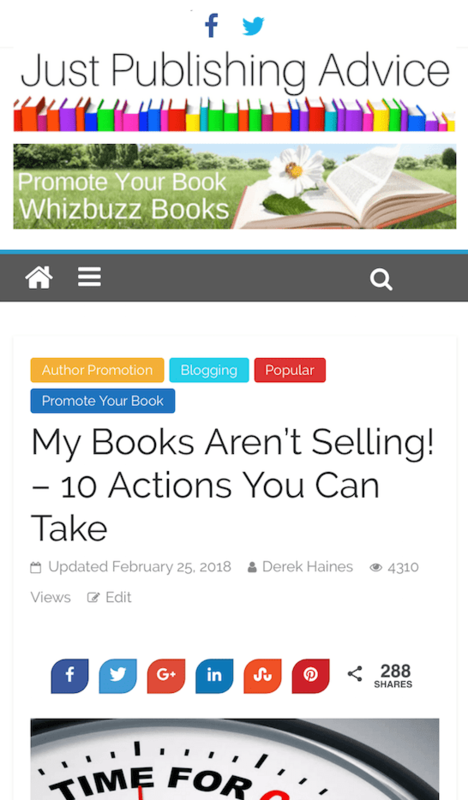 If you are an author promoting your books in sidebars and footers, it is time to have a big rethink about the design and layout of your blog or website. 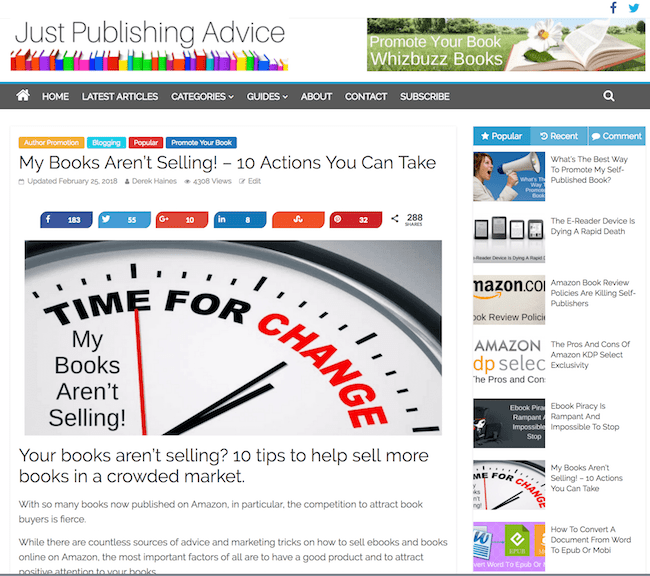 Over half of your visitors will not see your Amazon, iBooks or Goodreads widgets. Of course, you will find that it is not very practical to include your promotional widgets in the body of your articles. So the best way to achieve the same result is to use an image link as I have done on the left, or create inline links such as this. You can view my book Louis on Amazon. Of course, you don’t need to click on my example links above to know that they work. But they do show how easy it is to include links in the body of articles and posts, instead of always using sidebars for promotion and advertising. Creating a mobile friendly site. The very first step is to ensure that you are using a blog theme that uses responsive website design. This type of theme automatically produces a responsive web design that will suit the screen size of a range of mobile devices. You don’t need a web developer to do this. All you need to do is make sure the theme you use will give a good mobile experience for your site visitors. If you are using a free blogging platform like Blogger, Tumblr, Wix or WordPress.com, your blog will responsive by default. But you will need to move some of the elements in your blog to give a better user experience for phone users. In the two images above, you will notice that the one ad I have on the page is not in the sidebar. If you have Adsense ads or ads for your books in your sidebar, a better place to put them is in the header. Then both mobile and desktop users will see your ad. The same applies to social media icons. Another tip is to use a related posts widget at the end of your blog posts. Mobile users will see this before the comments, so it will help keep users on your site for a little longer. Another check to do is to make sure that your site can pass a search engine mobile friendly test. You can find a mobile test tool on Google or on Bing Webmaster tools. Lastly, your site should be fast loading on both mobile and desktop versions. You can check this on Google Pagespeed or Gtmetrix. Site speed is now such an important factor in search results as all search engines check how fast a page loads for users. So whether you are using your blog or website for book promotion or advertising revenue, make sure you consider mobile device users now and ensure that you redesign your sites so that they see what you want them to see, and click on. And yes. Nothing stays the same when it comes to all things Internet and website development. Change is the only constant. You save the QR-Code on your hard drive. Have business cards ptrnied with the QR-Code on it. The person you give your business card to can scan your business card with﻿ his mobile phone.